We have been receiving a lot of inquiries from tomato producers and tomato consumers every week. Once again here's another article about tomato. In just a matter of two years time, tomato industries and surprisingly the tomato itself had changed a lot. Tomato industries are becoming just like a computer-programmed production organization. The color, size, and nutritional value of tomato, and many others including their trade secret of agricultural technologies are in their purposes. We just can no longer find that big, pure reddish and baroque tomatoes without chemical substances, which we used to enjoy harvesting and eating when we were kids. 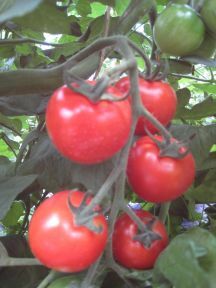 I myself have been trying to plant and produce those large, red, and tasty tomatoes without chemical fertilizer. But in our farmland, we just cannot imitate the same way we'd planted before. Is it because of environmental changes? Or is it because even the tomato itself is following the world fashion? Yes, it might be so. We tried to avoid using chemical fertilizers and chemical insecticides. We also tried to give chicken manure and cow manure as fertilizer. But we realize that the chicken we raise might be affected from commercial feeds, which might contain chemicals and some unknown toxic materials. We had to stop feeding any commercial products to our chicken to produce pure old manure as vegetable fertilizer. It's a big work, but there's no other way. We made our farm completely self-sufficient to do everything for itself—nothing is carried from outside world. Probably, due to climate and environmental changes, the shape, size, color, and taste of tomatoes, are changing. There must be something that is happening in this modern world. There's an old adage about tomatoes that says "The doctor will be blue when tomato is red". According to a study, people who eat tomatoes have a lower risk of acquiring vascular diseases such as heart attack and stroke, compared to people who do not eat tomatoes. We believe that one of the contributing factors is the medicinal properties that tomatoes contain, such as beta-carotene, vitamins, potassium, and most importantly, the tomato's red pigment "lycopene", a powerful antioxidant. - Lycopene prevents oxidation of cholesterol by eliminating free radicals by its strong antioxidant, which also prevents the clogging of blood vessels. - Lycopene has been known to be effective in preventing liver cancer and also helps eliminate free radicals in the brain, which helps prevent degenerative brain diseases. 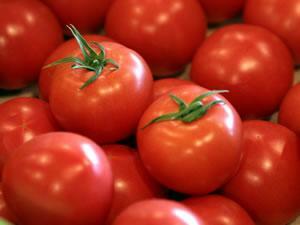 - Tomatoes potassium contents may lower blood pressure by effectively excreting excess sodium in the body. When Japan had experienced food shortage during the 1940s, I had to work hard with my uncle who had several acres of farmland, where he planted a few hundreds of tomato plants. My family and I were told to harvest and gather non-commercial-valued small and baroque-shaped tomatoes for family consumption. We used to grate small tomatoes mixed with sugarcane juice to add taste and satisfy our stomachs. Although we were hungry all the time, we were healthy and did not contract any grave diseases. Probably, tomato was the tight rope for our good health and mental strength. Many people worry about trans fats. Forget it. Just eat tomato and tomato products, and you might be out of danger from trans fat. Is it true? Well, it's under study. 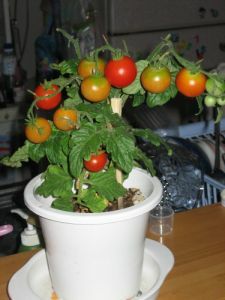 How about planting tomato in a clay pot near your windows? In this way, you can practically plant and harvest throughout a year. We do that and we enjoy it. During good weather, you can just bring it outside to give sunlight. By the way, there is no day without tomato and banana in our family. The heaviest tomato ever was 3.51 kg (7 lb 12 oz), of the 'Delicious' variety, grown in Edmond, Oklahoma, by Gordon Graham, in 1986. 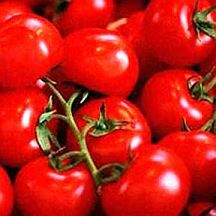 The largest tomato plant grown was 19.8 m (65 ft) length, of the 'Sungold' variety, grown in Mawdesley, Lancashire, UK, by Nutriculture Ltd (UK), in 2000. Botanically speaking, tomato is a fruit. From a culinary point of view, tomato is a vegetable. Tomato was once thought to be poisonous especially by our European ancestors, and was only used as an ornamental garden plant. 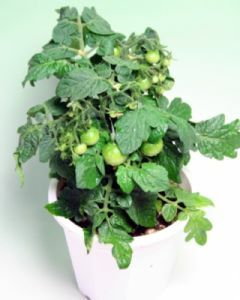 This mistaken idea arose because the plant belongs to the nightshade family, of which some species are really poisonous.